Do you have a business or practice with more than one location? Many managers, franchise owners and practice managers have found it to be increasingly difficult to get a consistent message out to multiple locations. Printing and distributing fliers or emailing announcements often get overlooked and are hard to police. We’ve found that being able to put the messaging up directly is the best way. But how can you control all of your TVs from one place? It’s Relevant TV makes it easy. It’s as easy as accessing logging in to the website or free iPhone/iPad app and selecting what you want to have shown on your screens. The settings can be updated 24/7 from anywhere. You can control one or multiple screens at once. This gives national brands dual level control. You can design ads, mix in images, change your social media preferences, and upload videos of your own. And best of all, the messages you distribute get seen! They garner more attention by being mixed with TV programs your customers want to watch. It’s your TV, make it work for you! It’s Relevant features more than just TV content. Custom messaging and weather from each location’s zip code are easily added and managed. The service gives you the ability to reach out to visitors in ways you can’t with basic cable. IRTV can be linked to your social media feeds, showcasing your most recent posts on Facebook, Twitter, and Instagram. It’s Relevant TV’s platform boasts a number of features that make the digital signage/video service an invaluable tool for businesses. Its library of 500,000+ short-form content licensed for public display is the largest of its kind, with the videos are spread across 40+ categories – allowing you to customize your waiting room TVs in ways that just aren’t possible with basic cable. One might expect a system as innovative as IRTV to be complicated, or run the risk of being too confusing to operate – but it’s easy! One of It’s Relevant’s most handy features, is Competetive Ad Block®. Competetive Ad Block® does what it says, it blocks competitive ads from showing up on your TV. With it in place, you never run the risk of people in your business seeing an ad for a “better” or more enticing deal across the street. Businesses that settle for basic cable have no control over outside messaging. The most valued feature of It’s Relevant TV is the free ad space which allows you to expose visitors to your brand and promotions. Between, and during videos, you have the option to showcase your brand on the side of the screen and inform visitors of any services or specials you want them to see. New products and services, catering, limited-time offers, members rewards, or even staff highlights, are just a few of the things you can promote. It’s Relevant TV is found in restaurants, medical offices, malls, retailers, sports arenas, car dealerships, pharmacies, salons, spas and more. Amazon Fire Stick, Chromecast, and Smart TVs are steadily emerging over the horizon, more so now than ever. With access to services like Netflix, Hulu, or HBO Go and devices that allow you to stream those services on your TV, cable is on its way out. TV has come a long way since the 1920’s, and as we get closer to 2020, looking back on the history of television during the last one hundred years and seeing how far we’ve come is pretty amazing. Today, televisions are just about everywhere you go. Everywhere. And they have been for a while. That’s because TVs are a staple of technology – we use them to reach out to one another, stay informed, and keep ourselves entertained. If you’re a business owner who caters to crowds, or often has people waiting or sitting for lengthy periods of time, then chances are you’ve got a TV within sight for the exact reasons just listed above. Which is great, the comfort of your customers is key – but in this rapidly advancing world of technology, it’s easy to get carried away when trying to build an inviting waiting room experience. Between all the technology available to business owners coupled with the drive to maintain customer satisfaction, the ease of putting something up like Netflix powered by an Amazon Fire Stick is second nature. So why wouldn’t you do it? The answer is simple. Because it’s illegal. The Netflix service and any content viewed through our service are for your personal and non-commercial use only. During your Netflix membership, we grant you a limited, non-exclusive, non-transferable, license to access the Netflix service and view Netflix content through the service. Except for the foregoing limited license, no right, title or interest shall be transferred to you. You agree not to use the service for public performances. Using those services with a “set it and forget it” mentality without regard for the licensing terms and conditions can be dangerous for your business. The people who enforce the rules on media licenses take this very seriously. For more information regarding why you should think twice about setting up services like that in your business, check out this article on using Netflix in your business. In the end, the licensing rights tied with those services only applies to personal use. Setting them up in your business is a no-go. But if you think about it, TVs and plug-ins like Fire Stick and Chromecast were designed with the home setting in mind, not business settings anyway. So you can’t use a Fire Stick in Your business to deliver any real TV content. Up until recently, this left you with only one real choice: cable TV. And while it’s legal to run cable in a business setting, cable TV isn’t designed for the benefit of your customers and your business. It’s Relevant TV is. It’s Relevant TV bridges the gaps between TV, customer satisfaction, and business messaging using unique digital sinage software – creating a more inviting place for visitors. The service provides businesses with content and control that makes for an all around better TV experience. IRTV creates a custom TV network for each business with access to a vast library of original content divided into a number of categories you can pick and choose from. On top of the TV content with more meaningful controls, your business also gets room to advertise additional services, reach out to customers, and share your latest social media posts. 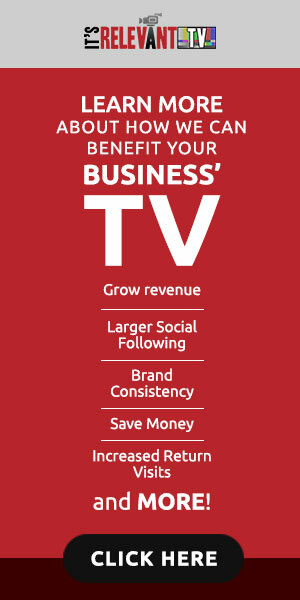 It’s Relevant TV turns your television into a tool for your business.